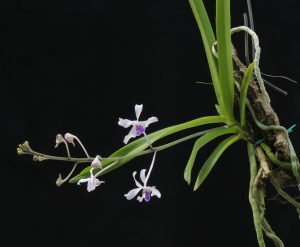 This wonderful small growing Vanda is native to dryish monsoon forests in the Western Himalayas (Arunachal Pradesh), Myanmar, Thailand and Southern China from around 300 to 1200m. The habitat we have seen in Arunachal Pradesh is open forest with a distinct wet season in the monsoon summer. 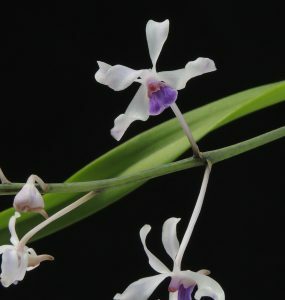 This plant was given to us by Dino (find out more about Dino’s amazing Orchid and Culture Tours in our previous post) as two leaves an half a root about three years ago so the plant is growing fast and we hope will develop into a multistemmed and multi-flowered specimen with time as this species can make magnificent mature plants.